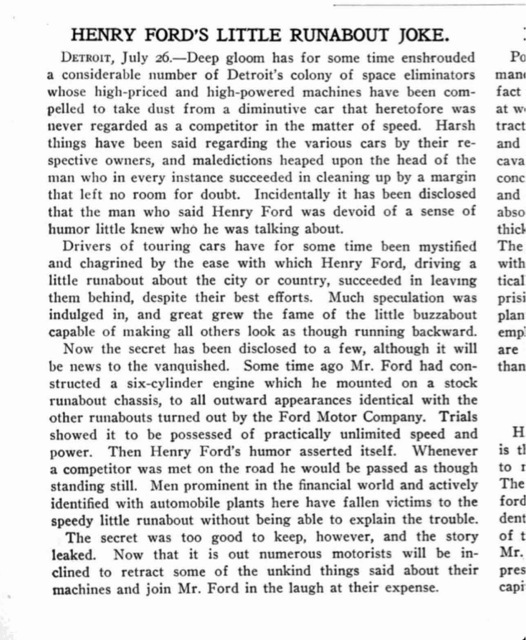 Henry Ford quoted saying the battery was acceptable as an ignition source over the magneto. Maybe a tough day in the experimental room trying to get the new Model T magneto working? He had to keep sales up of the NRS cars for another 6 months so he couldn't tell his current customers they were buying something that wasn't up to date..
Maybe so. Ford would sell a tremendous number of Model S along with some N and K over the next several months. It's the first time I've read anything by HF suggesting battery ignition was preferable to magneto ignition. The reasoning to include in the T the ability to produce an endless supply of A/C power was a sound one. Many folks in rural areas were glad to not have to be harnessed to a battery. Even with the naysayers telling the new T owner otherwise, a T with a healthy magneto and properly adjusted coils is smooth running and trouble free. Forgot to mention that the clipping you show is talking about a gear driven magneto (high tension). Those had wear points in the drive as well as delivery side. The low tension self contained unit in the T didn't suffer those ailments. Granted the timer would wear but the price was comparable to the batteries. When you're producing a low cost car, not equipping it with a magneto and all the extras required to go with it, such as a bracket, some sort of drive (gear, chain, or shaft), additional wiring, etc., reduces expense. With that being said, you would naturally promote the idea of batteries being superior to magnetos regardless if it was true or not. Who knows if Ford even provided the dry cells or if the buyer had to pay extra when they purchased the car? If Ford did supply the batteries, that one time expense to Ford Motor Company would still be substantially less than equipping the car with a magneto. However, for the owner, a total loss, dry cell system would be an ongoing expense as the cells would be needed to be replaced as they were depleted. Battery or not all Model T's had the batt position on the switch.That fact speak's loudly! Bud. From memory (always risky) I believe NRS were equipped with one dry cell. Additional dry or wet cell was extra I believe. There are bat one and bat two positions on NRS switches. The Model K was the least expensive domestic built car with standard magneto equipment in 1906 and 1907. 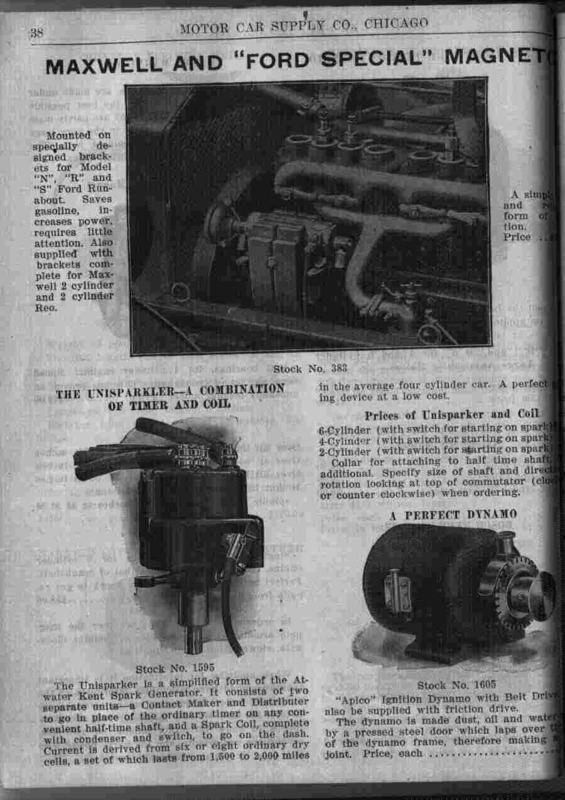 Ford advertising listed the dual ignition magneto system as one of the important features of the six cylinder model. For 1906 both Thomas and Pierce did not provide a magneto as standard equipment, doing so in 1907. 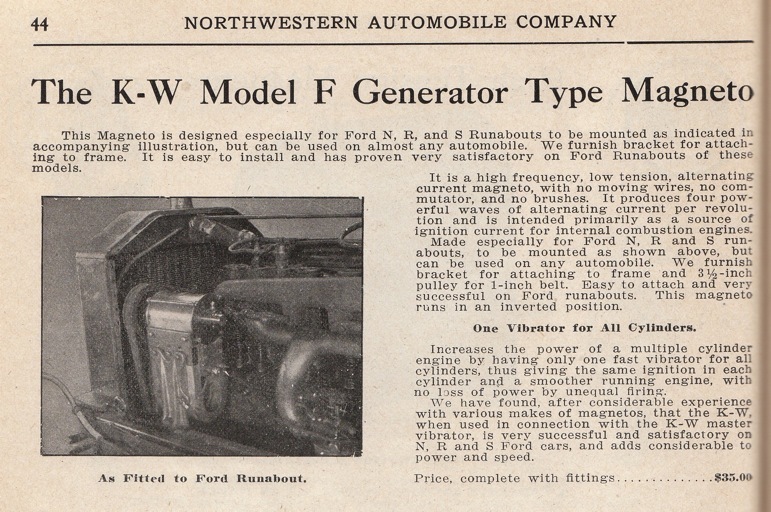 The Model K magneto wasn't really a low or high tension magneto (first working capacitive discharge ignition, or CDI system) and the patent for it was controlled by Henry Ford. I suspect that the magneto pad on the six cylinder NRS prototype car (1908) was set up for this Ford magneto, but don't have any proof of it. 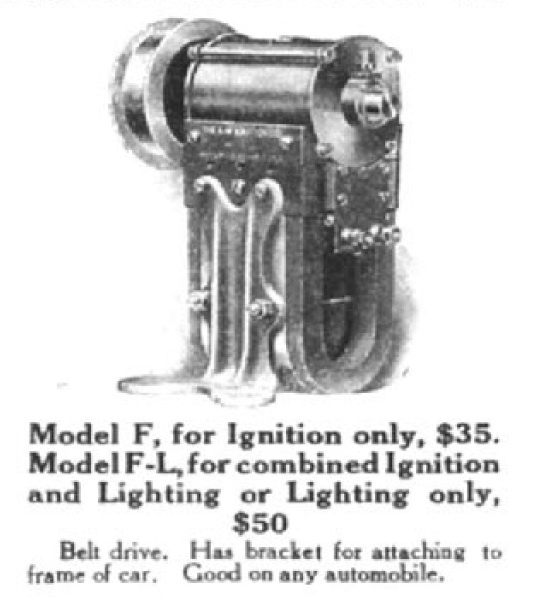 Personally I think the Model T that Ford advertised as early as the fall of 1907 was going to be equipped with this external Ford-Huff magneto. Interesting Rob, while agree Huff was the magneto man, what leads you to think he was thinking external mag? Transmission designs go back at least into mid 1908 and they seem to be designed around an internal mag. All early T's had a battery position on the wood coil box. I wonder if the cars were battery equipped from Ford or the dealer. It seems like a necessity to me, but I don't recall any evidence of batteries being standard equipment. 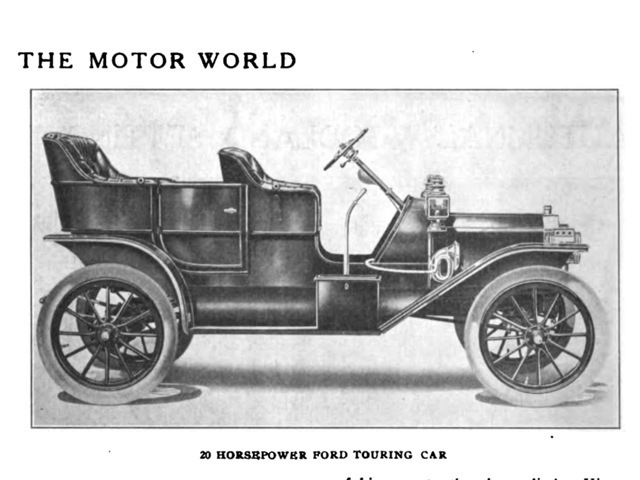 The ad below is from the "Northwestern Automobile Co. 1913 Catalog of Ford Specialities and Automobile Supplies," the earliest aftermarket accessory catalog I have ever seen published specifically for Fords. Northwestern Automobile Co. was an automobile agency in Minneapolis, MN and a Ford Motor Company branch from 1905 through almost all of 1912. Since the set-up is belt driven instead of gear or chain driven, I believe it serves only as a generator of electricity and does not appear to include any type of timing mechanism. In other words, it is a dynamo. 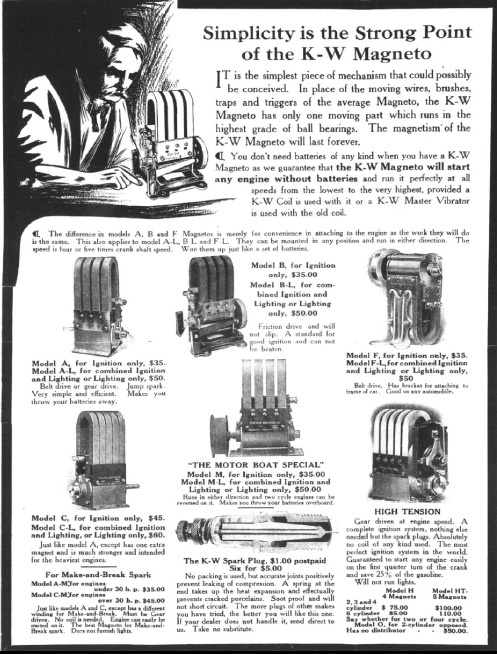 Also below is an K-W ad with close-ups of the model F magneto that appeared Trent Bogess's and Ron Patterson's ignition article that appeared in Vintage Ford. The lone existing six cylinder Model NRS has a "pedestal" cast into the aluminum crankcase for a magneto. I believe it also had a place where a shaft could have exited the crankcase to run the mag. Ed Huff applied for the patent for the magneto used on the Model K in July 1905, and the patent was issued in March 1908. Henry Ford was the patent assignee and Holley Bros. built the mag, used on all Model K. It was a unique magneto that developed a very hot spark. My suspicion is that a version of this magneto may have been intended for the 1907 Model T prototype (although I have nothing to link the car and magneto, other than the prototype six cylinder NRS engine had a place for a mag to be mounted). 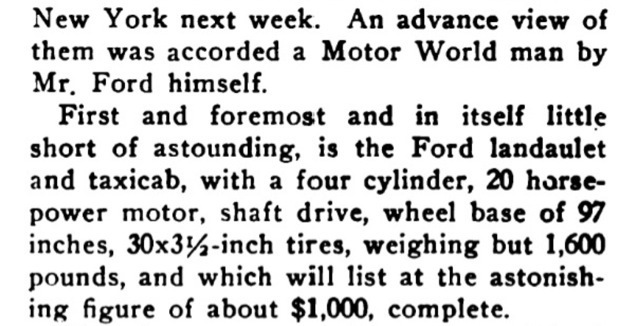 The 'prototype" Model T had a 97 inch wheelbase, and I think the reason the final version of the Model T 100 inch wheelbase may have been the additional distance required to build the transmission/engine/flywheel mag into one unit (again, no proof, just a suspicion). Kim, the battery position on the coil boxes were put there by the coil box suppliers, not by Ford. "The only equipment permitted to be attached to any Ford cars is a robe rail, a clock, and a tool box on the running board. 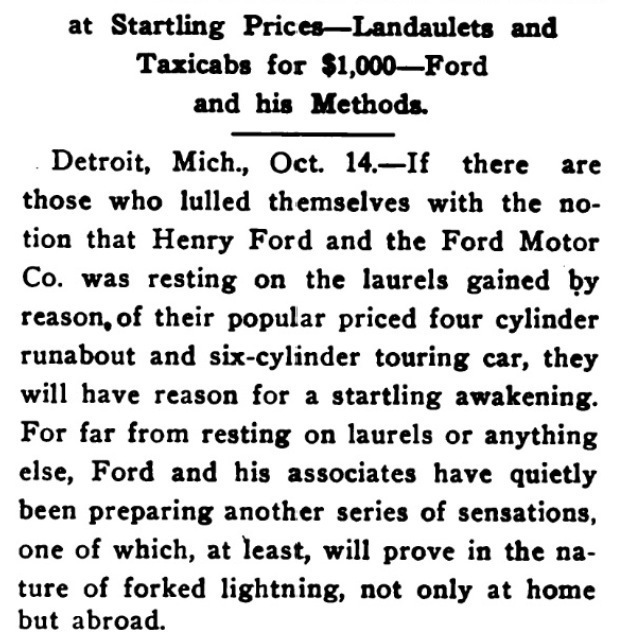 No exhaust cut-outs, trunk racks, bumpers, batteries or other items mentioned in previous letters should be recommended or permitted to be put on Ford cars either by our branches or by our dealers; and, as previously noted, our guarantee will become void if devices of this sort are attached." Maybe a number of customers had mistakenly attached a battery to the magneto and thus destroyed the magnetism - then tried to get it fixed on the guarantee..
Roger, all the early coil boxes had a battery side to the switch, even the 1913 metal box with the Ford switch has a battery side. Every early ford car I've ever owned had a lantern battery or a small rechargeable battery. I bet it was pretty common have some kind dry cell in the old days. I don't know about attaching a battery to a magneto? Not sure why anyone would do that. The only reason I can think for Ford to ban battery mounting by the dealers would be a concern about guarantee costs? People were not so used to electricity back then - and if there is a way to do something wrong, someone will do it. I have doubt's about about Ford not being involved as to the switch on the coil box wood or metal!! With no battery or provision for one what would be the need for a switch?? To stop the engine you simply retard the timing and stall the engine.Magneto,no movement no current no need for a switch?? Bud. We are told on the hunting trip when the storage battery tipped over and spilled acid it was thrown out!! Nothing ever tell's if there were dry cell's to be used just in case?? Is the story about the battery just a sale's gimmick? Would any of us make that trip today with no back up?? Bud.